Increased use of process automation and robotics around the world is driving demand for RAILTEC DIN rail PCB holders from OKW Electronics. OKW’s RAILTEC PCB holders are designed for mounting open PCB assemblies on standard DIN rails in equipment housings and control cabinets. Electronics engineers find these PCB holders extremely useful because they can be mounted to EN 50 022 TH35 x 7.5 mm DIN rails or EN 50 035 G32 DIN rails as standard - without the need for special adaptors. Typical applications include factory automation, building and safety systems, heating and air conditioning units, automatic timers, sensors, relays and signal distribution. 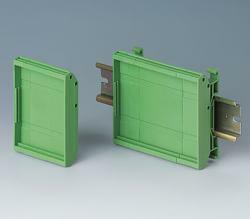 RAILTEC DIN rail PCB holders are molded in green self-extinguishing PA 66 with a flame class rating of UL 94 V-0. Two different types are available - modular and extruded (which can be cut to custom lengths). 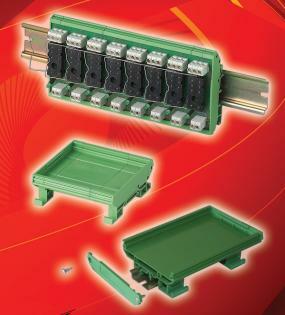 Modular DIN rail PCB mounts consist of snap-together end covers and intermediate base sections. Both parts are available with or without foot elements for mounting the unit to the DIN rail. The base sections are available in different lengths. They can be clipped together in series to achieve a suitable length for the PCB. OKW’s custom length versions comprise a single piece extruded base section and screw-on end covers. Separate foot elements fit to the rear of the base and are used to mount the unit to the DIN rail. The custom DIN rail mount extrusion is supplied pre-cut to the exact size required for the customer’s PCB. This can be up to a maximum of 1,000 mm (39.37”). Both versions are designed for mounting to EN 50 022 TH35 x 7.5 mm and EN 50 035 G32 DIN rails as standard. They are available in two widths for 72 mm (2.83”) or 107 mm (4.21”) wide PCBs. The PCBs are fitted to the base sections using slide-in guide rails. Prices start at $2.44 for a complete holder with integrated DIN rail clips. Accessories include a panel mounting element which can be used when the RAILTEC supports are not fitted to a DIN rail. OKW Electronics also supplies a wide range of DIN rail boxes, all of which conform to the DIN 46277-3 EN 50 022 standard for mounting to TH35 x 7.5 mm rails. A simple adaptor accessory also allows several models to be fitted to EN 50 035 G32 and EN 50 045 TH15 x 5.5 mm rails as well. For further details of OKW Electronics components, please view the website or contact Vice President, Sales, Sean Bailey, phone 866 603 7701. OKW Electronics, Inc specializes in high quality electronic components, supplying direct from the factory to OEM electronics customers all over North America. The company is a division of the OKW group of companies. It was founded in 1989 and is based in Bridgeville, Pennsylvania.